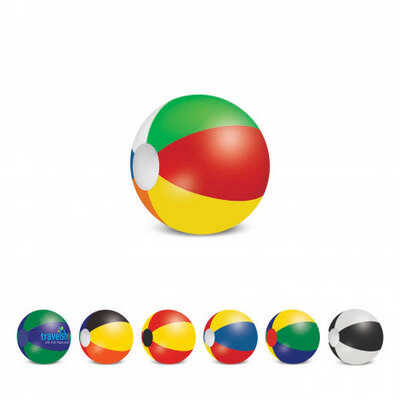 Beach balls in the choice of six different sizes supplied flat packed ready for inflation. The six side panels and two round end panels can be mixed and matched using the nine standard colours and other material colours may be available on request. The colour chosen for the round end panels must be the same for both ends. A production lead time of 20 working days applies to this product by air freight and larger orders can be sea freighted on request to reduce the freight cost. Colours: White, Yellow, Orange, Pink, Red, Green, Dark Blue, Brown, Black (Slight colour variations should be considered acceptable and other colours may be available on request). Dimension: Inflated: 28cm diameter. Print Description: Please refer to template. Print Type: Screen Print. Packing: Loose packed. Less than minimum quantities are not available for this item. MOQ applies per colour on this item. Price includes : 1 Colour 1 Position Print Setup is included.